I think it’s very important for people to understand that because I broke the story of possible extremist murder of Raudha and took a secular argument for the public consideration to avoid these things from happening in out country, it’s now basically become evident that these extremists are real and they need to silence me. So they have engineered a method to create doubt about me by making fake tweets out of a real conversation I had on Twitter. And if we start having a national conversation about the importance of secularism, their agenda of creating an ISIS style caliphate in the Maldives becomes more difficult. They will use democracy to get to top and start changing the rules. That’s been there strategy all over the world where they exist. Maldives is no different. So the best way to deal with the problem is have me killed or discredited or both. As you can can understand these are organized criminals dressed as pious men trying to Hoodwink the public because of an agenda. And their agenda involves the people of Maldives loosing their sovereignty, freedoms and democracy. Can you imagine living under ISIS? Because that’s where this is heading. 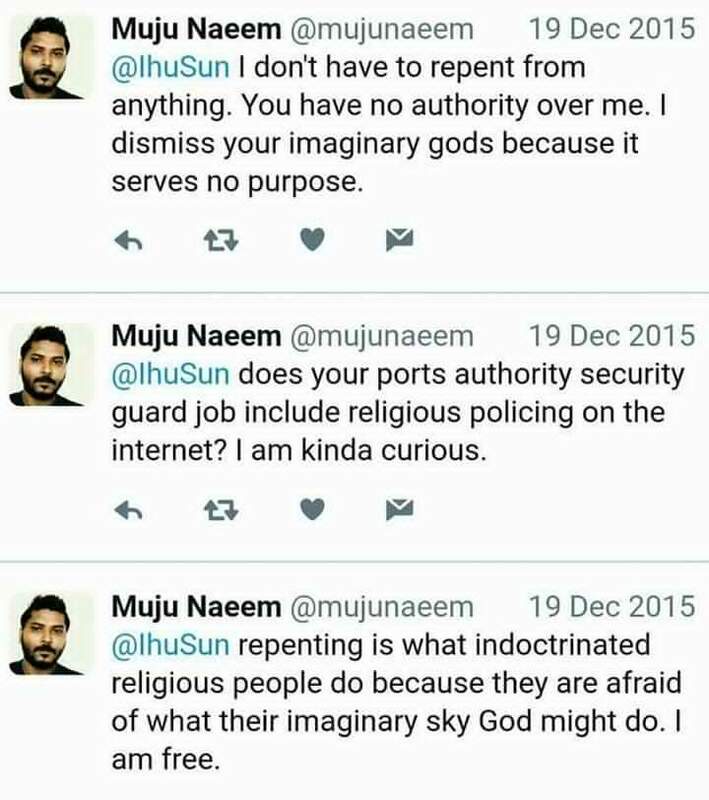 The 2nd tweet where I ask if the guys post authority job allow him to religious police is a real tweet. And the last tweet is also real. The rest is a fabrication. The forged screenshots hit the social media soon after Sheihk Mohamed Shafiu made a second statement about me. In a continued effort to discredit me and my work, this Sheihk has been actively involved in creating hate towards. 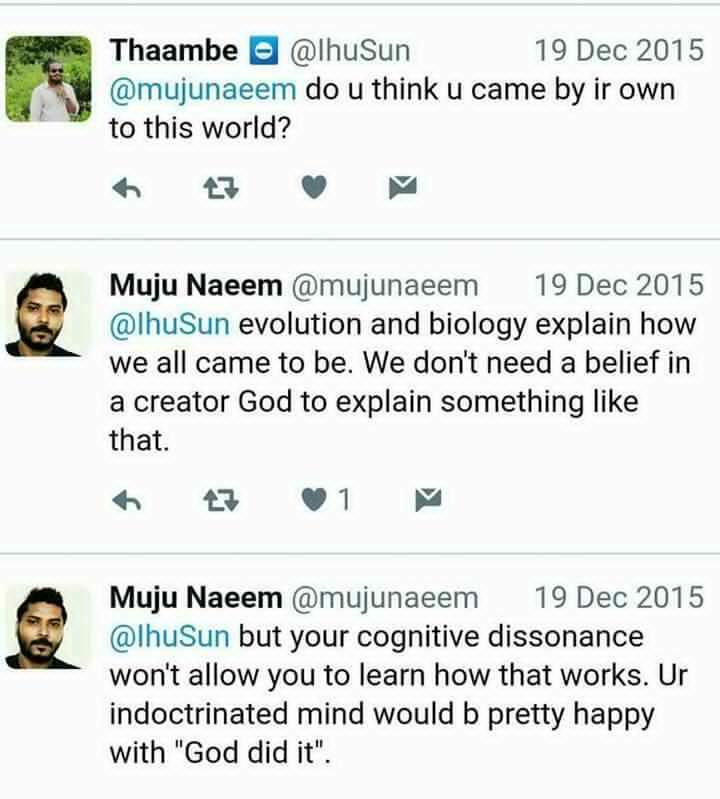 He is the same person who issued a facebook fatwa for my beheading as well. He has called me an atheist and laadheenee (irreligious) in the typical fashion these extremists use to justify attacking people they disagree with. They are incable of having a discussion on the issues being raised and are afraid of people who think for themselves because they are unable to execute their agenda of an ISIS style caliphate in the Maldives. His mission it seems is to inspire lone wolf type attacks on me. His user profile says that he is a Associate Lecturer at The Maldives National University. He also claims he is a writer at DhiSalafiyyah. And that he studied at Islamic University of Madinah. Went to Jalaluddin School and Ihavandhoo Madharusa. Ihavandhoo maybe the island he is from. A secular country is important for these guys to never reach positions of power in the government. Ever. This entry was posted in #FikuryIngilaab Threats, Extremism, Maldives. Bookmark the permalink.